A collection of Journals published each year since 1961, the Casselman Chronicle, relates the stories and history of the people, places, and events of the Casselman Valley. The Casselman Valley consists of southern Somerset County, PA and northern Garrett County, MD. An exciting find for genealogists and historians alike! All back issues and bound issues are available. Also available is a Fifty-Year Index (1961 – 2010) that lists names, places, and events covered in the journals. Browse the new Fifty-Year Casselman Chronicle Online Index. 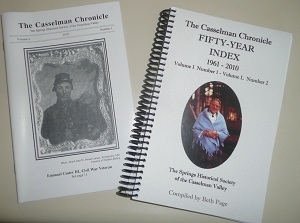 Membership to the Springs Historical Society includes the annual "Casselman Chronicle". * PA Sales Tax and shipping are extra.